How “deconstructed” can a group get? How about just one vocal, one bass, one guitar, and a basic beat supplied by stomping on a mini-tambourine-doohickey? 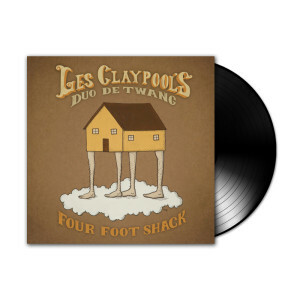 That’s exactly what everyone’s favorite storyteller/narrator, Les Claypool, is incorporating in his new band, Duo de Twang. While Les is still pulling double duty with the Primus lads, he has also found the time to unite with his old buddy, Bryan Kehoe, who fans will recognize from several past Claypool projects, and also as one of the main actors from Les’ hilarious jam band mockumentary, ‘Electric Apricot: Quest for Festeroo.’ But unlike Primus, DDT focuses more on the Americana/rootsy side of things – as heard throughout the band’s debut recording Four Foot Shack.